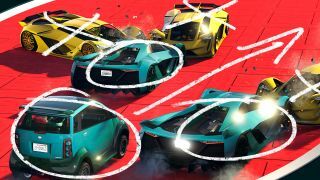 Lovers of car carnage, unite: GTA Online has given new life to the popular Running Back Adversary Mode, albeit with a few new twists for 2018. This new version is called Running Back (Remix), and it trades out the buggy-esque BF Bistas of the original mode for turbocharged Tezeracts. All of that sound like a bunch of nonsense words spat randomly onto your screen? Here's some context: Way back in 2015, Rockstar introduced Running Back as an Adversary Mode (Adversary Modes themselves basically being small mini-games to play against other players in the shared world of GTA Online). It is, in essence, American football played with cars. One player, designated a Runner, has two minutes to drive a small hatchback vehicle from one end of an asphalt 'field' to the other in order to score a touchdown. In its original incarnation, everyone except the Runner drove dune buggies. In Running Back (Remix), they drive sleek supercars. There are seven new tracks to be found across the GTA Online map, and playing any of them will net you the Santo Capra Coins Livery for the HVY Menacer & Pegassi Oppressor Mk II if you play between now and September 24, plus double the GTA$ and Reputation rewards now through October 1. Looking to conquer the single-player game? Then check out our GTA 5 Cheats and guides for everything you need to beat Grand Theft Auto 5.